Miss France Iris Mittenaere is the announced winner of Miss Universe 2016, Miss Haiti finished runner-up! 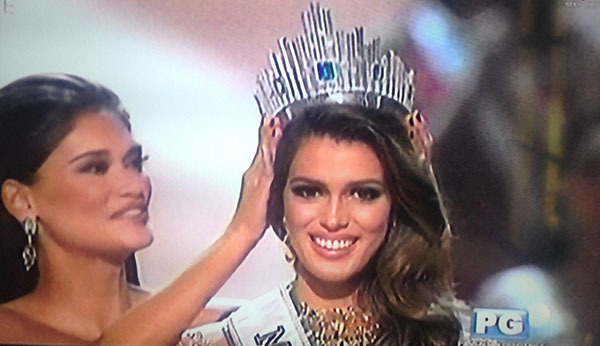 Iris Mittenaere from France is the crowned winner of the recently concluded Miss Universe 2016 beauty pageant. The 23-year-old beauty queen bested 85 other contestants during the Miss Universe 2016 grand finals held at Mall of Asia Arena in Manila, Philippines on Sunday, January 29, 2017. France answered: I think that when you fail you have to be elevated and you have to try again and keep going. I think I failed before but for me this is the best opportunity. Other winners of the Miss Universe 2016 beauty pageant Miss Colombia 2nd runner-up and Hiati finished 1st runner-up. Miss Myanmar took home the National Costume Award. Miss France Iris Mittenaere will fulfill her duty traveling around the world to represent the Miss Universe Organization and its various causes.